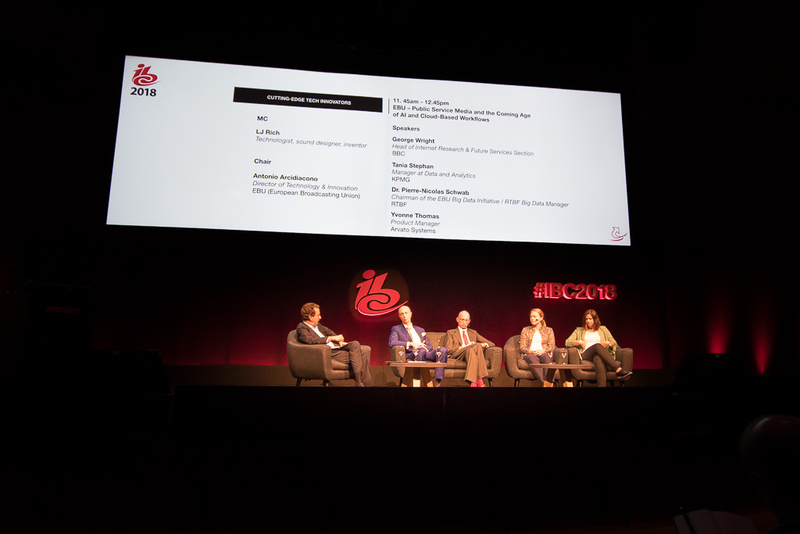 I’ve been attending the IBC show for the last 3 years and, although it’s a long and quite exhausting experience (the show lasts for 6 days including conferences and welcomes 57000 visitors), it has proved to be very rewarding each and every time. This year I also had the honour to be invited to speak in a “cutting edge tech innovators” session entitled “Public Service Media and the coming age of AI and Cloud-based workflows” that was organised by the European Broadcasting Union (EBU). This panel discussion moderated by EBU Director of Technology Antonio Arcidiacono was the opportunity for me to discuss the efforts done at the European level to promote the use of artificial intelligence among public service media companies. On this occasion I also spoke about filter bubbles (which we know in the meantime don’t necessarily exist and aren’t certainly a by-product of technology) and explained it had been a motivation for public service broadcasters to research and develop new types of recommendation algorithms. The efforts led by EBU around artificial intelligence have been key to promote the idea of “public service algorithms”. This will be the topic of a session at the FATRec workshop (whih I’m co-organising) of the RecSys conference in Vancouver this year. If you want to know more about the applications of artificial intelligence in the media industry, feel free to drop me a line.